No, I didn’t mistype. Chan was a Siamese dat. He hung out with my two dogs, slept with them, chased my younger Pit Bull Milo, liked to have his belly rubbed and begged for scraps. A few months after my 14 year old Siamese Cat Willie passed away in 2004, I had a hankerin’ for another Siamese. I am a passionate advocate for adopting from shelters or rescue groups. Strangely enough, there were no Siamese in over a hundred miles. I finally found one located at a shelter in Southwestern Illinois. They estimated the kitten to be 4-6 months old, which looked about right from the picture. 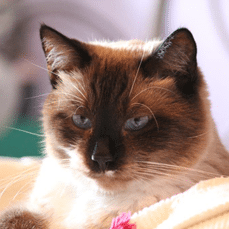 He was small, with light cream colored fur and black ears, tail and mask – but he was a snowshoe Siamese – meaning he had four white paws and a small white patch on his face. He was not a happy camper during the 3 hour ride home. When we finally arrived, he ran as fast as he could and hid – only coming out when he thought no one was looking. Eventually, he started coming out to look over his new family. Then he decided to get a closer look. Finally after about a month, he laid down next to Griffin, my son. When we took him to be neutered, we discovered he was actually more like 3 years old – not the 4-6 months. He’d been feral, and due to his diet his growth was stunted. After about 6 months with us, he started to look his age. He also started becoming an integral member of our family. After almost 9 years of being part of our family, we had to put him to sleep today. Cancer. He was so sweet, talkative and loving. He was also goofy. There’s a hole in our family and a hole in my heart. He was a very good boy.